WHAT DID JESUS REALLY DO THEN? Interlocutor: Did Jesus walk physically on the waters or he did it astrally so that his disciples see him? Ruanel: He didn’t walk astrally, but physically. And when he did it, He didn't trespass any physical law. The real levitation necessarily implies that the body stops being so dense. In the case of Jesus, the density of his body decreased enormously due to the Christic Energy that the Master had incorporated. It is necessary to also keep in mind the difference of density between the air and water. It’s not the same thing to slide or float in the air that has a specific weight almost null, than walking on the water that has a bigger specific weight. Interlocutor: But was he helped somehow by some spiritual entity? Ruanel: No, no, the Master intentioned to increase the Christic Energy to the maximum and that allowed him that the specific weight of his body was so light to walk on the waters. And, I repeat, it doesn't go against the physical laws. Interlocutor: Master, can I move on to another topic? Ruanel: Yes, but before I want to clarify something very important about mediumship. The more elevated or subtler the syntony of the vessel is the more possibility that he be destabilized exists. It is something similar to the radios when their fidelity can be affected by other devices that are closer. This vessel, for example that has this kind of “subtle syntony”, that is to say, a fidelity of transmission of more than 95%, percentage can be reduced if he is destabilized. Interlocutor: Concretely, what can destabilize him? Ruanel: Thought aggressions. Once the brother Kether, current Solar Logos of Ani, was channeled by this vessel and one of the attendants destabilized him to such point that he ended up breaking him down physically. Ruanel: These people that you mention don't have good intentions but rather their purpose is to attack the medium. Their way of thinking is so aggressive towards mediumship and that makes that the percentage he be destabilized and collapse raises to more than 90%. Besides, if the entity that come is a Spirit of Light, as is my own case, it potentiate the sensibility of the vessel making him affectable to be destabilized. This means that if somebody influences him negatively, by means of what you call "damages" in the physical plane, this vessel would not have any defense. Then, the smallest negative pressure would destabilize him with all the disastrous consequences on his physical body. Interlocutor: And if they were warned that they can destabilize to the medium with their negativity? Ruanel: It wouldn’t help because they do it unconsciously. Notice that the person that destabilized to this vessel, when Kether came, was a person that somehow had a friendly relationship with you and in spite of it, his presence was quite adverse. Imagine, then, what could happen with these people that you don't know personally and they already come with criticism and they want to prove a fraud. The physical damage that they can cause to the medium is enormous, because the chakra of his solar plexus which is the most sensitive chakra, it’s he has it completely helpless when he is channeling and in that moment it can affect him his stomach to such point of provoking him bleeding ulcers. Ruanel: Yes and the bad thing is that if you comment this issue to these people they will interpret it as an excuse to not making the channeling. Interlocutor: What do we do, then, Master? Ruanel: You have to evaluate it, keeping in mind that the bad vibration, as you say in the physical plane, can also interfere the fidelity of the transmission, because the physical organism helps a lot on this aspect. Interlocutor: OK, I will talk to Jorge about it after the session. Master Jesus: I am the Master Jesus, again with you. Interlocutor: Would you agree Master, if we move on immediately to the questions and when after responding them, you speak at length giving your message? Master Jesus: It is Okay, you can begin. Interlocutor: We know that in the multiplication of the loaves and the fishes, they were extracted from a parallel universe through the Christic Energy, but we ignore exactly how. We already know that you didn't go to a parallel universe to look for them. Master Jesus: No, of course I didn't go to a parallel universe, but rather it was an effect almost as transubstantiation. Transubstantiation is matter of the physical plane that goes to the spiritual plane and goes back to the physical plane. Only very few cases have been made throughout history. Directly what I did being incarnated was intention and automatically, let us call it through a “dimensional hole”, the loaves and the fishes have passed. When the fishes were multiplied generally there is no problem because one intention to extract them directly from the sea. On the other hand, when the loaves were multiplied extracting them from another place, what we look for is always to cause zero damage, because otherwise, even being a Master of Light, or from a Mastery plane as I was in that moment, I would have generated karma to myself. Interlocutor: Did you extract them with the help of the Christic Energy? Interlocutor: Let’s see if I understand, were the fishes extracted alive from the sea? Interlocutor: Were the loaves extracted from a parallel universe or from this universe? Master Jesus: The loaves were extracted from a parallel universe from an enormous deposit that had a great stock of loaves, as you say now. Interlocutor: And why wouldn’t it be a theft? Master Jesus: Because there was so great quantity of loaves that were not going to be used and they would end up rotting. Remember that the loaves not only can go stale, but also become moldy. In that time the loaves were made with special flour, in a very humid place, and they had very short shelf life. Interlocutor: So that extraction didn’t cause any damage then? Interlocutor: Did they also pass to this universe warm, as though they were out of the oven recently? Master Jesus: No, no, because those breads were piled up. Interlocutor: I understand. And could not the loaves and the fishes be extracted from this universe and not from a parallel universe? Master Jesus: Yes, but in this case it happened as I told you. I simply followed the suggestion of the Christic Energy. 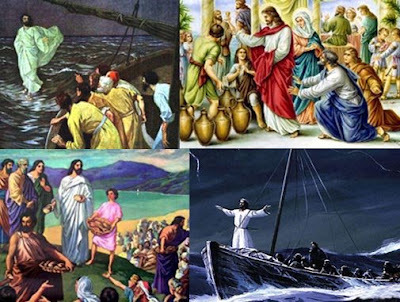 Interlocutor: Were the two times you multiplied the loaves and the fishes performed in this way? Master Jesus: Correct. In both cases the fishes came out from the sea and the loaves from deposits that had no longer use as food because in the term of 24 hours they would have been moldy. Master Jesus: What I said was misinterpreted. I had the yearning to continue giving teachings and in a certain moment it crossed my mind the idea that it was not my time to disincarnate yet. It was not a clamor of abandonment as if I were requesting for my physical part wanting to continue incarnated as a matter of physical attachment, but rather my interest was the continuity of my teaching, giving wisdom to the others. Master Jesus: The words "why you have forsaken me" are understood as a self-centered request, as a desire of attachment to the physical plane, and that never crossed my mind. Interlocutor: I agree on the interpretation you give about what you said, but the question is if those words were literal. Master Jesus: No, those were not the exact words, but "Father, why have not you allowed me to continue the work?". Interlocutor: Who heard those words? Master Jesus: The people that were in that moment close to the cross, my mother, Mary Magdalene, and my disciple John. Interlocutor: Aside from those words, it is known that you also spoke to the two thieves that were at your side. Master Jesus: What I said in that moment was also misinterpreted. The fact that I promised to them that they would be in the Kingdom of Heaven with me it doesn't mean that if they were in a plane 2 or in a plane 3 I could intercede so that they ascend of plane. Interlocutor: Would it be necessary here to state that “each one will emerge by his own effort”? Master Jesus: No, because that sentence could imply that the Masters of Light don’t care about the fate of those who are in error. "if you survive good and if you don't the same thing" , and it is not like that. We, The Masters of Light, are suffering permanently for those who astray, the famous “lost sheep”... How many lost sheep there are? Thousands and thousands! Interlocutor: Which would it be, then, the exact interpretation? But we cannot make more than that, because the action corresponds to the incarnated person. It is important to state that the Masters of Light never ignore those who are in the path of Error. Furthermore, we are more interested in those who are in error than those who are in Light. But the movement has to be made by the incarnated person, not by the Master. Interlocutor: I understand. Can one interpret as a lie what you told to the two thieves when you said they would be with you in the Kingdom of Heaven? Master Jesus: No, it doesn't pass as a lie, but to encourage them. It is the same thing you tell to a boy when you offer to give him an ice cream if he allows that he be injected. It is not that you didn’t buy an ice cream to him and you speculated with that. I have not speculated with them, because once we disembodied we have contacted all the time with their conceptual minds, other Masters and I, to tell them that what they had to do now was not to think of themselves, but in the others and they will arrive in this way to the Planes of Light . Interlocutor: In these moments in which plane those spirits are? Master Jesus: They are in the plane 4 and in mission. Interlocutor: Then, definitely it was real what you told them. Master Jesus: But it was not up to me, but from them, due to their behavior. My words would have fallen in the hole if their ego had dominated them and they had made their will. My merit on this matter was minimum, since the only thing I did was to fulfill the moral obligation of teaching them the path. After all, they were who had to walk on it. Interlocutor: There is something I wanted to clarify regarding to the word "lie", because there is a lot of confusion in the physical plane with this term. According to our dictionaries, lie is simply not telling the truth, and not telling the truth can be something good or bad according to the circumstances. Master Jesus: What you are saying is extremely important because for example to a sick person that has a very serious illness and who is also depressed, you cannot tell him suddenly, as you say, "dear brother, you are dying." This, instead of encourage him, which is what he needs, it takes away that expectation of healing and as a consequence he stops fighting to live. Interlocutor: It is clear, Master. I Also think that it is necessary to consider the "placebo effect", that is to say the Healing Energy of the Absolute encouraging him that would make it work and it would give him hope. Master Jesus: It also has to do with that, but do not confuse hope that doesn't generate karma, with false expectations that on the other hand generate karma saying: "look, stay calm you are going to heal", knowing that the person won't heal because the illness has implicated a very big part of his body. Interlocutor: What could we say to a sick person in this case? Master Jesus: You could say: "look, I will ask for your recovery in health" That is to say, one should not compromise the words. This is important to be well clarified. Of course that the placebo effect is important! But what you don’t have to do is to abuse of it promising things that you know won't be fulfilled. This, I repeat, generates karma. Interlocutor: The topic was perfectly clarified, and now I’d like to move on to a question we have asked in the last session but we didn't finish. I refer to the episode in which you calmed a storm. Master Jesus: As well as the spirits of Error can begin or manipulate a storm making focus, obviously that I am speaking of many spirits together not of few. What I have simply done was to use the Christic Energy to achieve the contrary effect, that is to say, to calm a storm. Interlocutor: I understand. Could this vessel do something similar? Master Jesus: Yes, he could do it, having enough confidence. Interlocutor: You want to tell me that if Jorge didn't have the enough trust on himself that he could do something like that then he could not achieve it. Interlocutor: Well, another issue is clear. The biblical episode, in which you transformed the water into wine, Was it real or invented? Master Jesus: It was a fantasy of the evangelists. Interlocutor: But I suppose that something should have happened in order to give place to something like that. Master Jesus: Yes, of course. I Clarify that although that conversion from water to wine didn't happen, or at least it didn't happen as they have described, the fact can be made. Interlocutor: Always with the Christic Energy? Master Jesus: No, because then we would be speaking of changing an atomic formula. Interlocutor: And how that cand be made, then? Master Jesus: Bringing the wine from a parallel universe. Interlocutor: The same as the loaves and the fishes? Interlocutor: But, concretely, that never happened. Master Jesus: Correct. In the famous marriage at Cana there were pots that contained a lot of good grape juice deposited in the bottom, and what I simply did was to suggest to the householders that they add water and then mix those intact remains with some thick sticks. After they sifted the mixture there was a better wine than the one they had served at the beginning. Interlocutor: That is to say that you didn’t even do it, but the householders. Master Jesus: Exactly, the only thing I did was to suggest the solution. In fact, it was something very simple because the pots conserved in the bottom the grape juice of the stepped grape. Interlocutor: How much quantity of wine was made in this way? Master Jesus: Almost twenty liters because there were many pots, since it was a very important party. And the wine that they obtained was harder than the previous one, what you call a thicker wine and therefore better. Interlocutor: Is this the explanation of why it was said that they set forth the worst wine in the beginning and here they said they kept the good wine at the end? Master Jesus: Exactly. But I want to reiterate that it was not even my merit, because it was only knowledge of how one could obtain more wine. Interlocutor: Is it clear. Did they take it as a miracle and for that reason the biblical story appeared, or directly they did know the truth and they invented the fact? Master Jesus: No, they believed it was a miracle. In a big party there are always remains of wine in the pots, a quarter liter in one, an eighth in other. They mixed all those remains and they ended up obtaining enough wine, when they mixed it with the grape juice deposited in the bottom as a result they obtained an excellent beverage. Master Jesus: No, it’s not necessary, it is something very simple. Ask me one more question because I want to release to the vessel who is very destabilized. Master Jesus: In the area of Judea. With regard to the mission in that planet there is not a lot to say. It was a mission of union directly, so that the schism that had taken place was dissolved. Interlocutor: Was it something similar to what Kether, the Solar Logos of Ani did, when he embodied to solve a very serious dispute that had taken place on his planet? Master Jesus: Yes, it was something very similar. Interlocutor: How were the inhabitants of Fulgor 5? Master Jesus: They were beings of silicon. If you saw them you would perceive them with a metallic tonality. Here on Earth you are made of carbon. Inside the atomic chart they are compatible. What that planet had was a very difficult radiation to support by my human physique. Interlocutor: Not for them, of course. Master Jesus: Sure, not for them. Interlocutor: What technological level did they have compared to Earth? Master Jesus: The technological level was highly advanced from the moment in which they had been able to change my vibration in the episode of the Transfiguration so that I could be compatible with them. Interlocutor: Did they travel through time or it was always in the same present of the Earth? Master Jesus: No, they didn't travel through time, but through the subspace. Interlocutor: But they did have the technology to travel through the time didn’t they? Master Jesus: No, they didn’t have it yet in that time. Interlocutor: And the technology to pass to a parallel universe? Interlocutor: Which was the real purpose that you accepted that mission? Interlocutor: I understand. Is the air of that planet similar to the one of our planet? Master Jesus: No, it is not similar, but in my case they compatibilized with a potabilizer. Master Jesus: No, not in the nose but in the part of the trachea, because I could also breathe through mouth. Interlocutor: Did they make you an implant? Master Jesus: Yes, but the implant was harmless.